When you operate a drill press, it is essential to follow the safety precautions. The reason for this is that you can get hurt easily while working with a safety drill. So, let’s get to know the precautions for working with a drill press. First of all, knowing the drill press fully is important and you can do that while reading the owner’s manual carefully. Also, acquiring knowledge about different applications, limitations, and the hazards associated with a drill press will help you immensely. When you work, try to wear safety goggles or a face shield. Before you turn on the power, make sure that the chuck key is removed and you can use a self-ejecting chuck to ensure that the key is not remained in the chuck accidently. Plus, when you plug in the cord, check whether the switch is off or not. It will allow you to avoid any accidental starting. Besides, at the time of repairing a drill press, always disconnect it from the power source. People suggest avoiding a hand auger bit in a drill press and you should use drills and bits for only machinery purposes. You can also take help from the owner’s manual to figure out which are the recommended accessories. If you use inappropriate accessories, you can expect to have problems in the future. While using the workpiece, you need to hold it tightly and it will block any kind of spin off the table. Generally, fastening the workpiece securely with clamps and hold it in a vise is the best way work with a drill press. This will help you to drill or bore small workpieces. You need to wear clothes that are not loose and wearing any kind of jewelry is also not allowed while working with a drill press. Also, make sure that you have kept the guard on the spindle pulley as it will stop your hair or cloth getting caught by the drill press. It’s best to use the recommended chuck or spindle. Most of the operations will be successful if you use the 0 to 1/2 in. capacity geared drill chuck. Keep in mind that all the adjustments need to done before switching on the power. Also, make sure that the drill bit or cutting tool is perfectly locked in the chuck. To keep the hole under the drill, you have to adjust the table. Plus, you can set the depth stop to shun drilling into the table. This is a good idea to keep a piece of wood under the workpiece to stop this. Staying close to the recommended spindle speed is always safe and using lower speed is beneficial. If you use high speed, you can burn the cutting tool or workpiece. Also, high spindle speed can throw the table with vicious force. On the other hand, if you use extremely low speed with a heavy feed, then the tool can dig into the workpiece. It will freeze the motor or it can break the cutting edges. Remember that when you change speed or make an adjustment, you need to disengage the machine from the power supply to stay away from any accident. Raising the bit often to clear the chips out of the hole is good for the deep cuts. 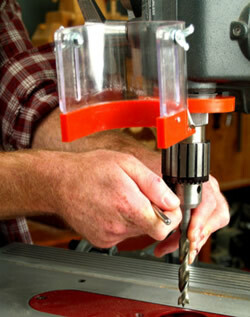 In any case, the drill is fixed in the hole; you need to disconnect the machine before increasing the bit. To keep the table and workpiece clean, you can use a brush. Always disengage the machine from the main power supply before cleaning. If you are using sanding drums and abrasive accessories, you need to make sure that area is perfectly ventilated. When you turned off the power source, don’t make an attempt to stop the machine by holding the chuck. Now, after turning the power off, you have to wait until the drill stops completely. Lastly, position the key to the OFF position and remove the switch toggle. It will make the drill press kid-proof.